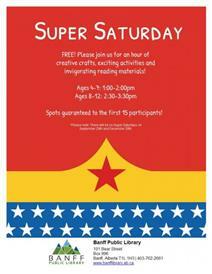 Ages 4-7: 1-2 p.m. Ages 8-12: 2:30-3:30 p.m.
Stop by the Banff Public Library for an hour of creative crafts, exciting activities and invigorating reading materials. Ages 4-7 are welcome from 1-2 p.m. and ages 8-12 are welcome from 2:30-3:30 p.m. Spots guaranteed to the first 15 participants.